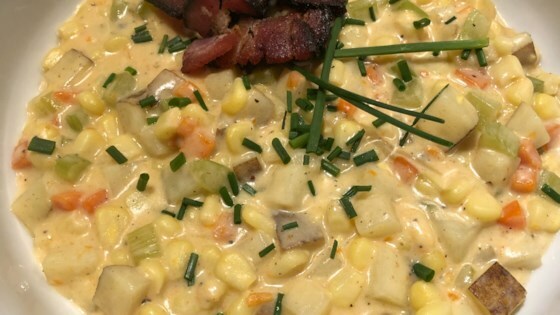 "A quick and delicious comfort food made with canned corn, potatoes and bacon." Cook the bacon pieces in a large skillet over medium heat until the fat has rendered, and the bacon is crispy, about 8 minutes. Remove the bacon, leaving the grease in the pan. Stir the carrot, celery, and bay leaf into the bacon grease; cook for 5 minutes. Meanwhile, melt the butter in a large pot over medium-low heat. Whisk in the flour, and cook for 5 minutes, stirring constantly. Slowly whisk in the milk, and bring to a simmer over medium-high heat. Once simmering, cook for 5 minutes, whisking frequently. Add the bacon, cooked vegetables, potatoes, and corn. Return to a simmer, then reduce heat to medium-low, and cook until the potatoes are tender, about 20 minutes more. Use additional milk as needed to to achieve desired consistency. Garnish with paprika to serve. A rich, creamy chowder with bacon and potato—just like granny used to make. I loved this. Also, added a can or cream corn. I did what others suggested and went with half milk, half broth. Also, added a little spice (parsley and thyme) and Johnny's seasoning. Yum!